At this point, my Wii game library is comprised of only 4 games (including Wii Sports). I’ve saved the best game for last–The Legend of Zelda: Twilight Princess. There are so many things to say about this game and most of you probably know everything about it. But, for those that don’t, I’ll try to give a comprehensive review anyway. I’ll try not to mention names or anything to spoil the game. 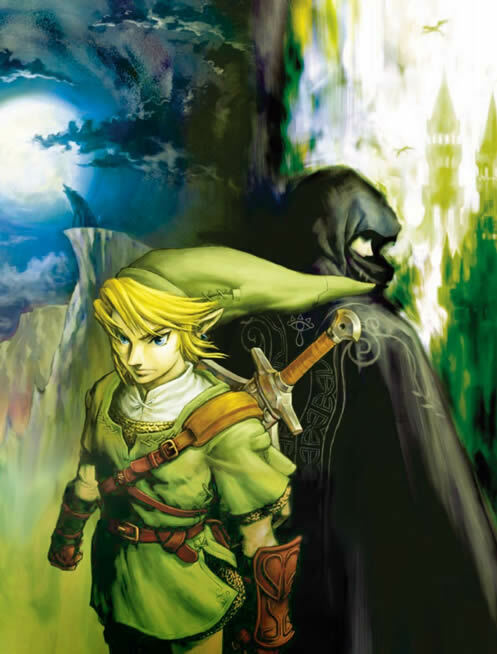 Twilight Princess starts out with everyone’s favorite pointy-eared hero: Link (or whatever you happen to call him). You start in a small village and progress through the game as most other games. Link is asked to deliver something to Hyrule Castle. Like most Zelda games, the story usually starts small and builds as you progress the game. This Zelda adventure is no different. The scope of the game, as far as you know in the beginning, is to deliver an item and save your friends. Isn’t it amazing how Link always gets himself into trouble after that? Anyways, after about 15 hours into the game, you start to see the BIG picture. The story balloons into the whole battle of good v. evil as you go on. The story is absolutely amazing and is just as enjoyable playing through a second time. I haven’t beaten the game twice yet, but I’ve picked up on some things that make a lot more sense now. 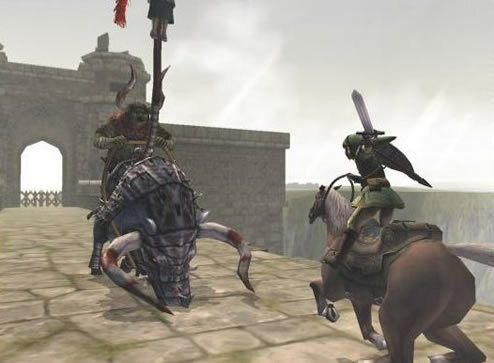 The story and characters really make Twilight Princess a true masterpiece. There are plenty of twists and turns throughout the game. Some things you expect to happen don’t and others….well, you’ll see. Overall, the story immerses you even more so than the controls. 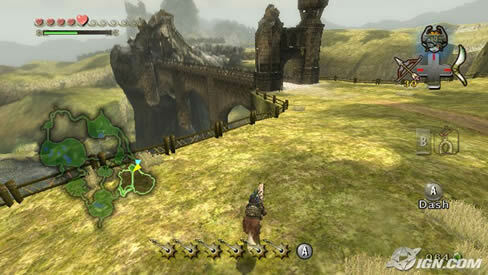 The gameplay in Twilight Princess is the pinnacle of puzzle-solving and adventure games. There is nothing more rewarding than going through a dungeon only to get stuck, then miraculously figure out the solution. I can remember at least 2 or 3 times when I stumbled upon a solution to a puzzle. Afterwards, I thought to myself: “There is no way I would’ve figured that out had I not been swinging my sword or shooting something.” Another great thing is how the game builds upon itself for more challenging obstacles. Trust me, it doesn’t get easier as you go along. I thought I had seen every possible type of puzzle since I’ve played all the games, but there are quite a few that had me stumped in the later levels. The gameplay is fun and engrossing the more you play. The controls complement the gameplay very well. The controls, for the Wii version anyway, are very unique. 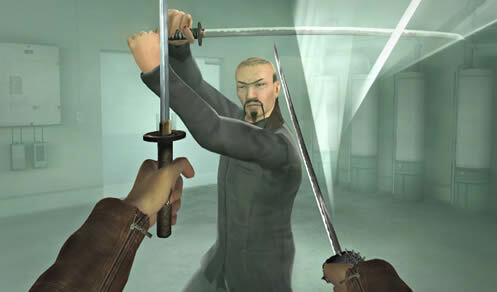 The sword and other weapons like the bow are controlled with the Wiimote, while other movements are controlled using the nunchuk. The controls are very precise and create a very vivid interaction with objects and enemies around you. The accuracy of the Wiimote for aiming is pristine. I’ve never played anything that was more responsive and downright fun to use. The ability to transform into a wolf is an amazing addition and adds new gameplay experiences to the Zelda series. Controlling the wolf has its advantages over being human. 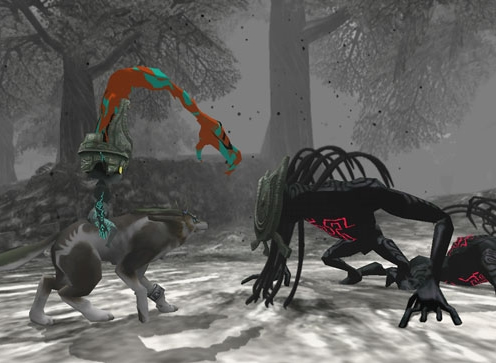 For one, wolf Link can run faster than human Link. There are also some other distinct advantages/disadvantages of each form, but some are probably spoilers. The game really needs to be played in order to fully experience everything. Red Steel is a game that has come under fire ever since it was released and even before its release. I have played through most of the story mode and have played A LOT of multiplayer. I’m not sure if most of the reviewers that reviewed the game didn’t play through the game all the way or not–but it seems to me they didn’t give the game enough credit for what it sought to accomplish with new ways of using the Wiimote. Well, let’s get started on the story mode. 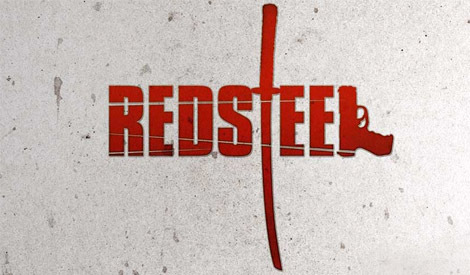 The storyline for Red Steel is different than most, but fits the mold of a few other games. You play as an American named Scott. Your fiancee has been kidnapped and you father-in-law is part of a Yakuza clan. There is another Yakuza group who is responsible for his daughter’s kidnapping. So, naturally, you’re the one that’s supposed to save her. The storyline develops more as you go along, but it really isn’t the strong point of the game. The story mode can be frustrating at times. You go through 5-10 checkpoints in each different level, which is good because you can load from these checkpoints. The annoying thing is that you die A LOT–so it’s a good thing they have lots of checkpoints. Overall, the story mode is engaging enough to keep you coming back and playing. 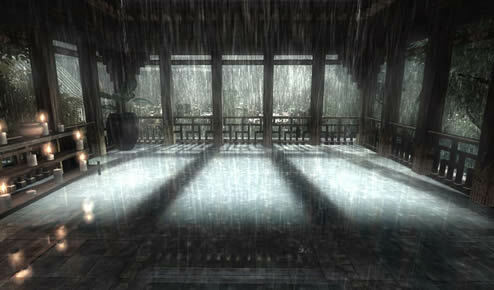 It offers plenty of new sword skills and weapons to master as you progress. One thing I wanted to mention that I LOVE about the game is the upgradable sword techniques. At first, I was pretty disappointed in the mediocre sword fighting. But the farther you get in the game, the more sword moves you can master. Some of the newer moves require a lot more coordination. The beginning moves don’t require much, but the more complex moves are quite rewarding. For example, one move requires that you slash the wiimote right, then left, then slash the nunchuk left. It does all these moves in succession on the screen, so it’s like a slash, slash, parry. Very cool. Anyways, on to the multiplayer. Excite Truck was one of the games I purchased at launch, and one I’ve played almost non-stop since then. 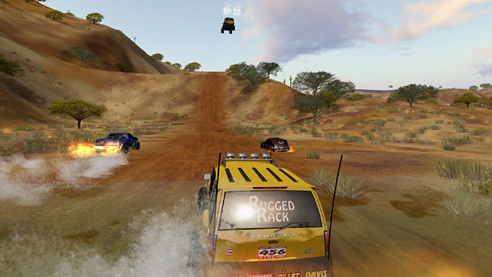 It’s a game that brings the fast-paced arcade style racing to the living room. I was skeptical at first to how the game would play, but my worries washed away in a splash of truck carnage. Tricks and getting stars are the name of the game. While it’s good to get 1st in a race (you get 50 stars), the important thing is to get as many stars throughout the race. Big air, drifts, tree runs, air spins, truck smashes, and rings all add to your star count. The game provides plenty of unlockables as you progress through the game. 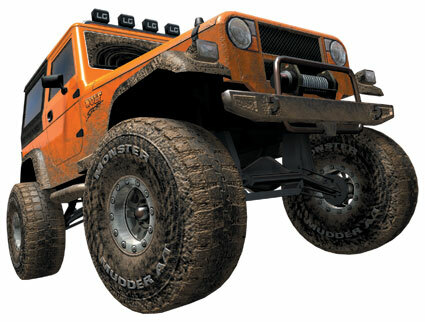 There are tons of trucks, levels, tracks, and trophies to unlock. Excite Truck has pretty intuitive controls. Most everyone I’ve played multiplayer with both experienced and non-experienced didn’t seem to have a problem picking the controls up. The multiplayer offers only 2-player support, but there’s a lot going on. I’m not sure it would be as fun looking at even a smaller split-screen, even if more of your friends could play. It’s a fun way to relax and get some fast-paced racing compared to something like Need for Speed. Use Wiimote to perform tricks. Prince of Persia: TTT Wii Confirmed! UPDATE: Updated article with pics from new NP mag.